To investigate whether topography-guided laser in situ keratomileusis (LASIK) with anterior corneal astigmatism measured on the WaveLight Contoura (Alcon Laboratories, Inc., Fort Worth, TX) leads to better refractive outcomes compared to treating on the clinically measured manifest refractive astigmatism axis in eyes with primary myopic astigmatism. Retrospective analysis of 1,274 consecutive LASIK eyes treated on the topography-measured anterior corneal astigmatism axis compared to eyes treated on the conventional clinical manifest refractive astigmatism axis. In eyes with a small axis discrepancy between anterior corneal astigmatism and refractive astigmatism of 5° to 20°, there was no significant difference in efficacy index, refractive astigmatism accuracy, and most Alpins vector analysis parameters. Both treatment modalities achieved 20/20 uncorrected distance visual acuity (UDVA) in 90% of eyes, with 95% having postoperative cylinder of 0.50 diopters (D) or less. In eyes with a large axis discrepancy between 21° and 45° treated on the anterior corneal astigmatism axis, outcomes were both statistically and clinically inferior. Fewer eyes achieved UDVA of 20/20 (88.9% vs 73.6%; P = .01) and fewer had a defocus equivalent of 0.25 (65.6% vs 52.7%), 0.50 (86.9% vs 80.0%), and 0.75 (97.5% vs 90.9%) D or less (P < .05 for all). Significantly more eyes achieved an angle of error greater than 15° (25.4% vs 8.1%; P = .004), had postoperative residual astigmatism of 0.75 D or less (18.2% vs 7.4%; P = .03), and needed an excimer laser re-treatment (11% vs 1.6%; P = .007). Topography-guided myopic astigmatism LASIK treated on the topography-measured anterior corneal astigmatism axis resulted in inferior refractive and visual outcomes compared to treating on the clinical manifest refractive astigmatism axis. Topography-guided laser vision correction uses high-resolution corneal topographic maps to generate a custom ablation profile. This method regularizes the corneal surface, directly treating anterior corneal higher order aberrations (HOAs).1–3 Because significant corneal HOAs can manifest as spherocylindrical manifest refractive errors,2,4,5 topography-based ablations that correct anterior corneal HOAs can affect refractive predictability. The effects of corneal HOAs, together with internal optics and cortical perception, explain why the clinically measured manifest refractive astigmatism and the anterior corneal astigmatism (ACA) measured by topography are often different in magnitude and axis.6 Controversy exists as to which astigmatism magnitude and axis to treat: manifest or corneal. The WaveLight Contoura topography-guided platform (Alcon Laboratories, Inc., Fort Worth, TX) was approved by the U.S. Food and Drug Administration (FDA)7 for the primary treatment of myopic astigmatism, with the manifest refraction supplied to the Contoura software as the treatment input.7,8 Two small sample size reports, treating on the Contoura-measured ACA axis or close to it, were published in an attempt to optimize outcomes and reduce refractive surprises.9,10 These preliminary studies suggest that treating on the topography-measured ACA axis has benefit. This study compared the efficacy, refractive accuracy, predictability, Alpins cylinder vector analysis, and safety of Contoura topography-guided laser in situ keratomileusis (LASIK) treated on the manifest refractive astigmatism axis versus treated on the Contoura-measured ACA axis in a large cohort of eyes with myopic astigmatism. A retrospective electronic medical record database review comprising consecutive eyes that underwent a primary Contoura topography-guided procedure using the WaveLight EX500 excimer laser (Alcon Laboratories, Inc.) between June 2017 and March 2018 was conducted. 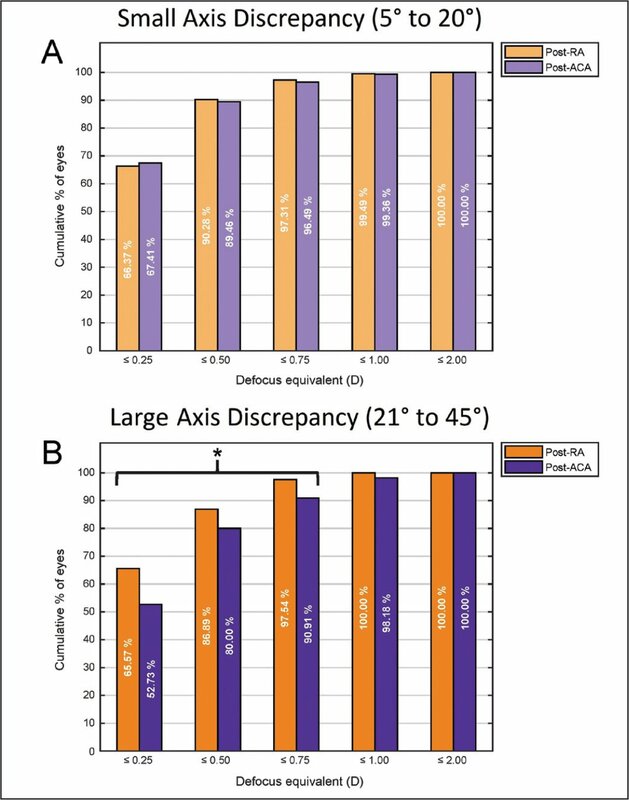 Inclusion criteria were preoperative corrected distance visual acuity (CDVA) of 20/20 or better, refractive astigmatism magnitude of 0.75 diopters (D) or greater, and a difference between the refractive astigmatism and Contoura-measured ACA axis between 5° and 45°. Eyes with less discrepancy were excluded to ensure that treatment protocols were clinically distinct. Eyes with cylinder below 0.75 D were excluded because treatment errors would be less likely to result in a clinically significant postoperative residual astigmatism. Standard inclusion criteria for LASIK were also required, including no evidence of subclinical keratoconus on corneal topography, adequate corneal tissue, no previous ocular surgery or disease including visually significant cataract or macular disease, no systemic diseases that affect corneal healing, and age older than 18 years. Eyes with naturally occurring irregular astigmatism and asymmetrical topographies on keratometric maps were not excluded. Eyes with intraoperative complication(s) and follow-up shorter than 1 month were excluded. This study was approved by the institutional Ethics Review Board of the Canadian Ophthalmic Research Centre, and all patients provided a written consent for surgery and use of anonymized data for research. All procedures performed fulfilled the principles of the Declaration of Helsinki. Between four and eight corneal topographies were acquired on undilated eyes with the WaveLight Topolyzer VARIO (Alcon Laboratories, Inc.). Criteria for image acceptance included appropriate recognition of the pupil and the mire edge by the software, mires with minimal breaks, the absence of significant missing data (shadow from the eyelids, eyelashes, nose, or dry tear film), a percentage of data obtained (analyzed area) greater than 90% in the 6.5-mm zone, and a median of absolute deviation variability score below 0.10. Maps were compared to assess the reproducibility of the data including keratometry, Q value, and axis of astigmatism. Images that did not meet the criteria were excluded. The remaining images were exported to the Contoura software to generate the ablation profiles. Eyes for which adequate scans could not be obtained were excluded. The WaveLight Topolyzer VARIO generates a high-resolution anterior corneal elevation map using 22,000 points from the corneal surface. The Contoura-measured ACA uses 9 to 10 Placido rings over an area of 6.5 mm. The elevation data are best fit with an asphere (least square fit) and subtracted from the median anterior cor-neal height profile to obtain the anterior corneal aberration profile. Zernike analysis is performed on this anterior corneal wavefront. Zernike polynomials C3 (oblique astigmatism) and C5 (vertical astigmatism) are then converted to the astigmatism axis and power in diopters at the optical zone of choice, which was 6.5 mm in this study. Given that the ACA is derived using the C3 and C5 polynomials, the Contoura-measured astigmatism magnitude and axis are neutral to HOAs. To process the final ACA value, the median from several scans (4 to 8) is used, further improving the ACA accuracy. The clinically measured manifest refraction sphere and refractive astigmatism magnitude were entered into the Contoura software as treatment parameters for all eyes. A custom nomogram developed using a large electronic medical record outcomes database was used to modify sphere and cylinder. The astigmatism axis was used as the single independent variable. Manifest refractive astigmatism axis was used for treatment in the first 905 consecutive eyes, followed by treatment of the Contoura-measured ACA axis for 369 eyes. ACA axis treatments were terminated when analysis of results showed worse outcomes than treatment on the refractive astigmatism axis. All surgeons followed the same previously described standardized technique,11 using the same equipment and identical nomogram, treating the refractive astigmatism axis in the first group of consecutive eyes and then treating the ACA axis in the following group of consecutive eyes using the WaveLight EX500 excimer laser with the Contoura software. The relative volume of eyes per surgeon remained constant during the study. The Intralase femtosecond laser iFS (Abbott Medical Optics, Inc., Santa Clara, CA) or Z15, Z16, or Z18 Hansatome Microkeratome (Bausch & Lomb, Rochester, NY) in combination with an 8.5- or 9.5-mm suction ring were used to create the corneal flaps. The target was emmetropia in all eyes. A standardized postoperative regimen11 of antibiotics and steroids was used. Ophthalmic examination data were collected preoperatively and 1 to 3 months postoperatively. A short follow-up period was chosen to minimize the effect of secondary biomechanical and epithelial changes and to potentially minimize cerebral adaptation to astigmatism. In this way, one can more accurately gauge the immediate and actual impact of treatment with less effect from secondary compensation. Accuracy, efficacy, and safety were assessed. Standard graphs, defined by the Journal of Refractive Surgery,12 were produced. 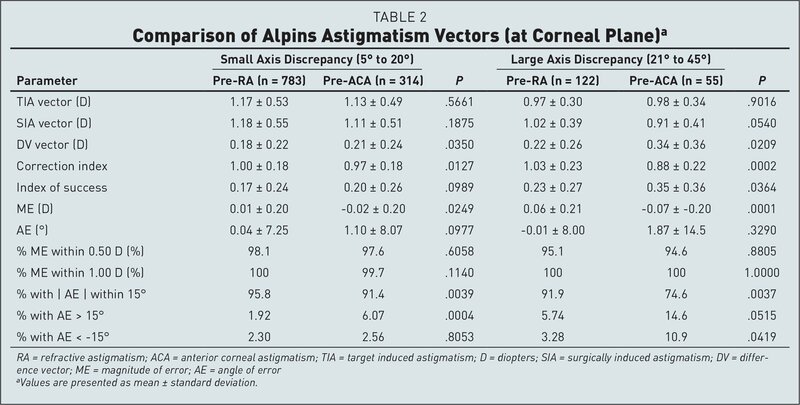 Astigmatism correction was assessed using the Alpins vector analysis method.12,13 Standard Alpins vector graphs, calculated at the corneal plane, were produced with the AstigMATIC software.14 Postoperative data reported were obtained before any excimer enhancements. Treatments performed using the Contoura-measured ACA axis were compared to those using the manifest refractive astigmatism axis. Eyes treated on the refractive astigmatism axis and ACA axis were divided into small and large axis discrepancy groups for investigation. Statistical analyses were conducted in MATLAB R2018a software (Mathworks, Natick, MA). Unpaired samples t tests and non-parametric Mann–Whitney–Wilcoxon tests were used. Statistical significance was set at a P value of less than .05 and all data were reported as means ± standard deviations (SD). A total of 1,274 topography-guided treated eyes were evaluated, including 905 consecutive manifest refractive astigmatism axis treatments followed by 369 consecutive Contoura-measured ACA axis treatments. The median time interval between surgery and the last follow-up visit was 2.3 months. Of the 1,274 eyes, 1,097 (86.1%) had a refractive astigmatism versus ACA axis difference ranging between 5° and 20° (small angle group), whereas 177 eyes (13.9%) had a discrepancy ranging between 21° and 45° (large angle group). The discrepancy between the refractive astigmatism axis and the ACA axis followed an exponentially declining distribution, where progressively fewer eyes had an increasing axis discrepancy (Figure 1). The small angle and large angle groups were each subgrouped into eyes treated using the refractive astigmatism axis (refractive astigmatism axis treatment subgroup) and eyes treated using the Contoura-measured ACA axis (ACA axis treatment subgroup). 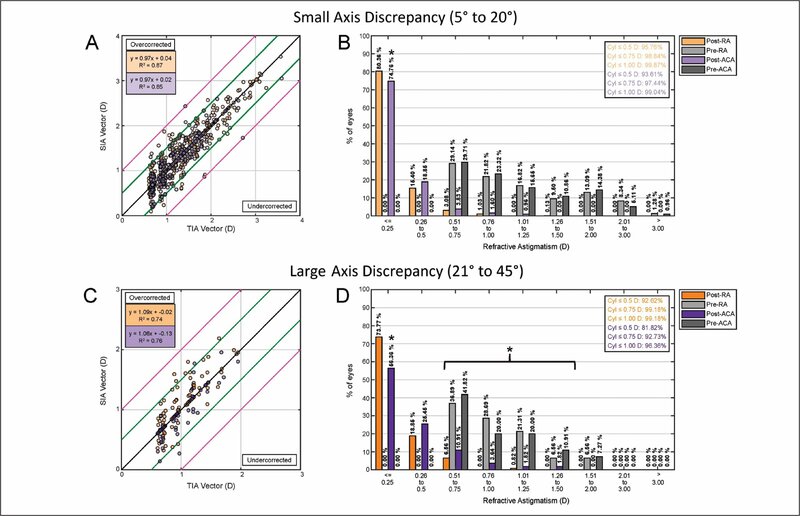 There was no difference in the distribution and average of the axis discrepancy between eyes treated on the refractive astigmatism and ACA axes in the small angle and large angle groups (P = .33 and .80, respectively; Figure 1 and Table 1). All other preoperative characteristics, including age, visual acuity, manifest refraction, ACA, magnitude of discrepancy between refractive astigmatism and ACA, ocular residual astigmatism (ORA), corneal HOA maximum ablation depth, keratometry, and corneal thickness, were also comparable between eyes treated on the refractive astigmatism and ACA axes (all P > .05; Table 1 and Table A, available in the online version of this article). Although this study included eyes that had both femtosecond laser–assisted and microkeratome LASIK, the relative distribution of microkeratome and femtosecond laser flaps was the same in all groups. The target was emmetropia in all eyes. 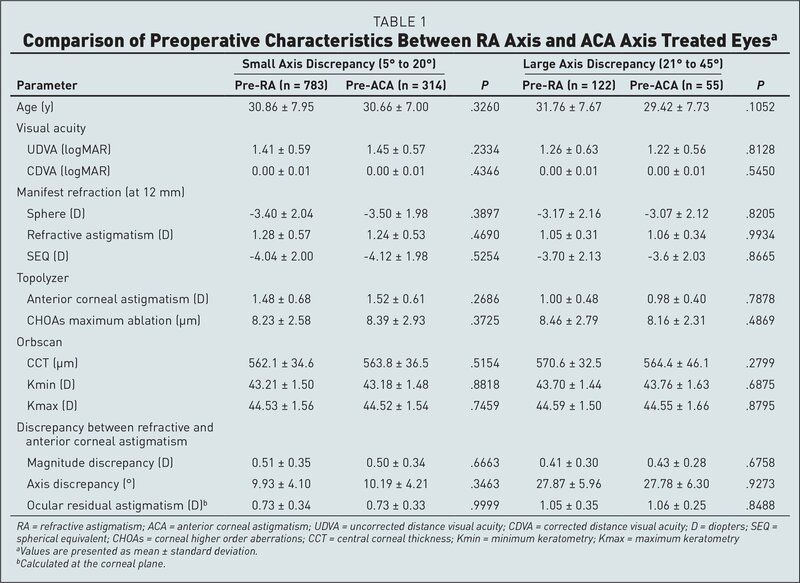 Distribution of the discrepancy between the refractive astigmatism (RA) axis and the anterior corneal astigmatism (ACA) axis in (A) RA axis treated eyes and (B) ACA axis treated eyes. The thick black curves represent the exponential fittings of the distributions, both having high coefficients of determination (R2). In the small angle group, the efficacy index of eyes treated on the refractive astigmatism and ACA axes were similar (0.98 ± 0.06 vs 0.97 ± 0.09; P = .84), and the cumulative postoperative unilateral uncorrected distance visual acuity (UDVA) was comparable (Figures 2A–2B). In ACA axis treated eyes, 2.4% more eyes had two or more postoperative UDVA lines worse than preoperative CDVA (Figure 2B; P < .05). In the large angle group, the cumulative postoperative unilateral UDVA of refractive astigmatism axis treated eyes was 20/20, 20/25, 20/30, and 20/40 in 89%, 99%, 100%, and 100% of eyes compared to 74%, 91%, 96%, and 98% in ACA axis treated eyes (P < .05; Figure 2C), resulting in a significantly lower efficacy index (0.93 ± 0.14 vs 0.98 ± 0.07; P = .0018; Figure 2D). 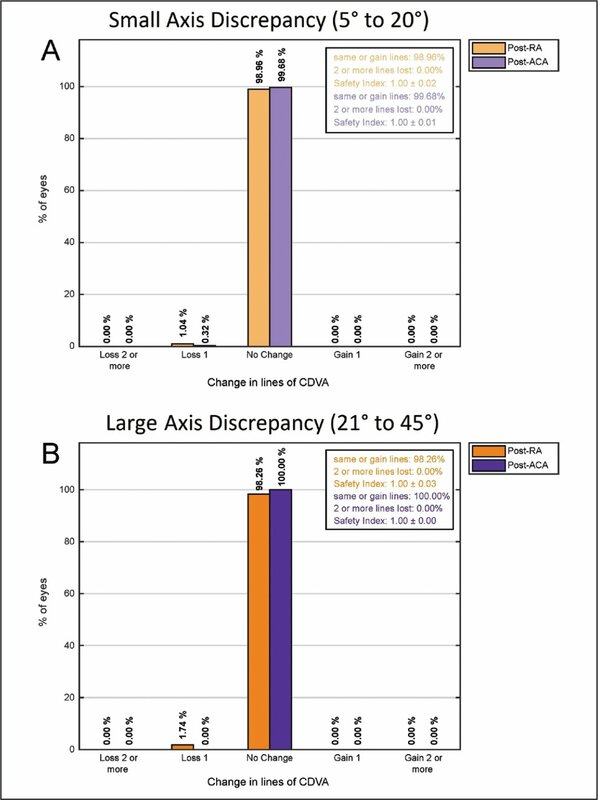 In ACA axis treated large angle group eyes, 15.3% more eyes had one or more postoperative UDVA lines worse than preoperative CDVA (P < .05; Figure 2D). Cumulative unilateral postoperative Snellen uncorrected distance visual acuity (UDVA) of refractive astigmatism (RA) axis and anterior corneal astigmatism (ACA) axis treated eyes, compared with preoperative corrected distance visual acuity (CDVA), in the small (SAD) and large (LAD) axis discrepancy groups (A and C, respectively). 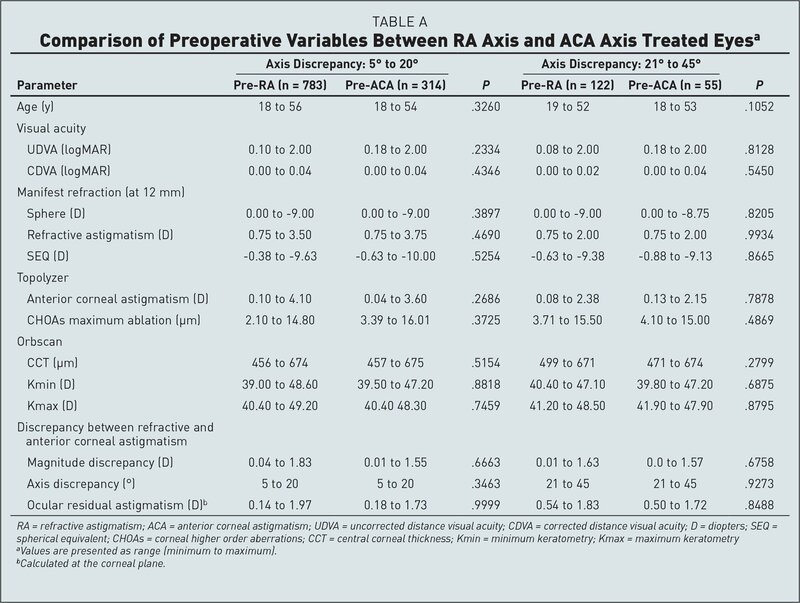 Difference in postoperative UDVA lines of RA axis and ACA axis treated eyes, compared to preoperative CDVA in the SAD and LAD groups (B and D, respectively). The attempted versus achieved spherical equivalent (SEQ) scatterplot revealed R2 values of 0.98 in both small angle and large angle axis difference groups and treatment protocols (Figure A, available in the online version of this article). A similar percentage of eyes had a SEQ within 0.25, 0.50, 0.75, and 1.00 D of the intended target (P > .05), irrespective of groups and treatment protocols (Figure A). In contrast, although the cumulative defocus equivalent histogram of eyes treated on the refractive astigmatism and ACA axes was highly comparable in the small angle group (P > .05; Figure 3A), in the large angle group, ACA axis treated eyes had significantly fewer eyes achieving a defocus equivalent of 0.25, 0.50, and 0.75 D or less (65.6% vs 52.7%, 86.9% vs 80.0%, and 97.5% vs 90.9%, P < .05; Figure 3B). In the small angle group, 80%, 96%, 99%, and 100% of eyes were within 0.25, 0.50, 0.75, and 1.00 D of the intended plano cylinder in refractive astigmatism axis treated eyes versus 75%, 94%, 97%, and 99% in ACA axis treated eyes (P < .05; Figure 4B). In the large angle group, 74%, 93%, 99%, and 99% of eyes were within 0.25, 0.50, 0.75, and 1.00 D of the intended plano cylinder in refractive astigmatism axis treated eyes versus 56%, 82%, 93%, and 96% in ACA axis treated eyes (P <.05; Figure 4D). In the large angle group, a greater number of ACA axis treated eyes had residual astigmatism of 0.75 D or greater compared to refractive astigmatism axis treated eyes (18.2% vs 7.4%; P = .03; Figure 4D). Although the astigmatism treatment predictability was comparable using both treatment protocols, the R2 between the target induced astigmatism (TIA) and the surgically induced astigmatism (SIA) was close to 0.86 in the small angle group and close to 0.75 in the large angle group (Figures 4A and 4C). The correction index (CI) of eyes treated on the refractive astigmatism and ACA axes was comparable and close to 1 in the small angle group (P = .0127; Table 2), whereas in the large angle group, ACA axis treated eyes had significantly undercorrected cylinder compared to refractive astigmatism axis treated eyes (CI: 0.88 ± 0.22 vs 1.03 ± 0.23; P = .0002; Table 2), with poorer index of success (0.35 ± 0.36 vs 0.23 ± 0.27; P =.0364; Table 2). In both the small and large angle groups, the incidence of absolute angle of error greater than 15° was much higher in the ACA axis treated eyes compared to refractive astigmatism axis treated eyes (small angle group: 8.6% vs 4.2%, P = .0039; large angle group: 25.4% vs 8.1%, P = .0037; Table 2). 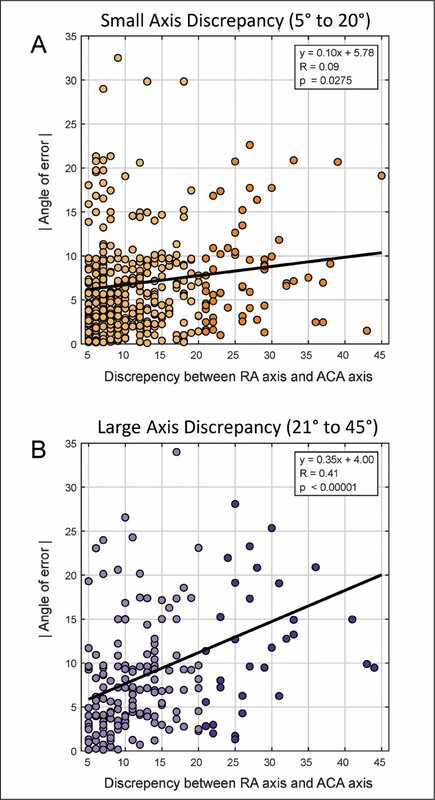 A moderate correlation was found between the angle of error and the discrepancy between the refractive astigmatism and ACA axes in the ACA axis treated eyes (R = 0.41; P < .00001), but not in the refractive astigmatism axis treated eyes, where only a weak correlation was found (R = 0.09; P = .0275) (Figure B, available in the online version of this article). In both the small and large angle groups, the percentage of eyes with an absolute magnitude of error within 0.50 and 1.00 D was not significantly different between eyes treated on the refractive astigmatism and ACA axes (P > .05; Table 2). Additional Alpins vectors and parameters are reported in Table 2 and graphed as single-angle polar plots in Figure C (available in the online version of this article). 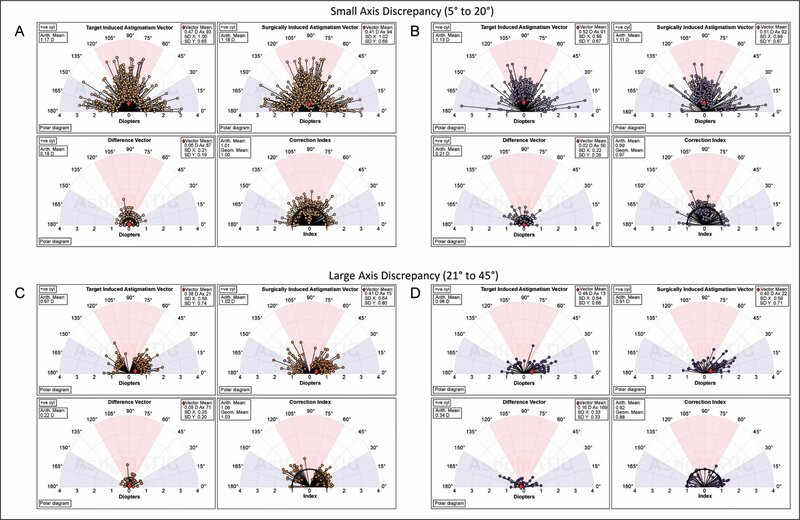 Scattergrams and correlations for the discrepancy between refractive astigmatism (RA) and anterior corneal astigmatism (ACA) axes and the absolute angle or error in the small (SAD) and large (LAD) axis discrepancy groups (A and B, respectively). Eyes without residual postoperative cylinder were discarded from the scatter-grams to better reveal the correlations. Single-angle polar plots generated using the AstigMATIC software14 to illustrate the target induced astigmatism (TIA) vector, the surgically induced astigmatism (SIA) vector, the difference vector (DV), and the correction index (CI) in refractive astigmatism axis treated (A and B) vs anterior corneal astigmatism (ACA) axis treated eyes (C and D) in the small (SAD) (A and B) and large (LAD) (C and D) axis discrepancy groups, respectively. All vectors were calculated at the corneal plane. The vector means are plotted as a red diamond. In both the small and large angle groups and the refractive astigmatism axis and ACA axis groups, no eye had a loss of two lines of CDVA and close to 100% had no change of CDVA. 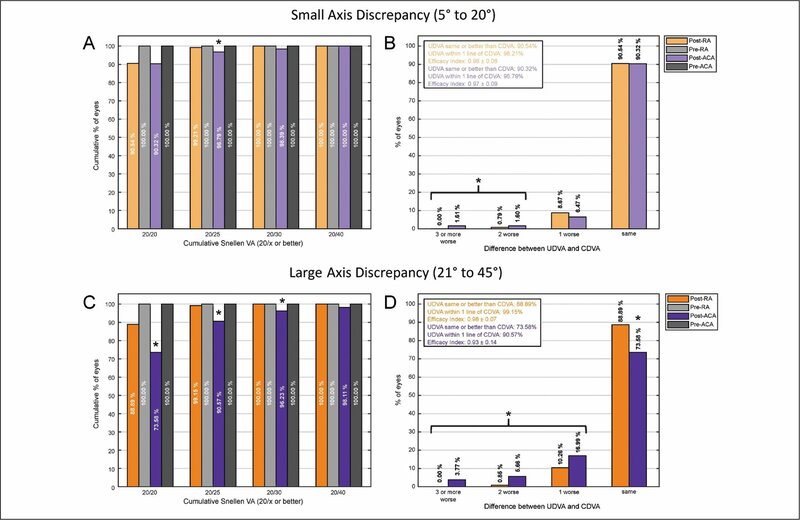 There was no statistical difference in the percentage of eyes losing one line of CDVA between treatment protocols in both the small and large angle groups (P > .05; Figure 5). The safety index was equal to 1.00 for both groups and treatment protocols (P > .05; Figure 5). (A) Change in Snellen lines of corrected distance visual acuity (CDVA) before and after surgery compared with preoperative CDVA. Spherical equivalent from before to after surgery in the small (SAD) and large (LAD) axis discrepancy groups (A and B, respectively). In the small angle group, 0.6% of refractive astigmatism axis treated eyes received a subsequent laser retreatment compared to 2.2% in ACA axis treated eyes. In the large angle group, 1.6% of refractive astigmatism axis eyes received an enhancement compared to 11.0% in ACA axis treated eyes (P < .05). Manifest refractive astigmatism and ACA rarely precisely coincide in magnitude or axis.6 This is the first study to characterize this discrepancy in a myopic astigmatism study population, showing progressively fewer eyes with an increasing axis difference between the manifest refractive astigmatism and ACA. Of study eyes with 5° to 45° of axis discrepancy, 14% had an axis discrepancy greater than 20° and 5% had greater than 30°. The ACA axis treatment approach in the current study resulted in refractive and visual outcomes comparable to using the refractive astigmatism axis in eyes with an axis discrepancy between 5° and 20° (small angle group). Both treatment protocols achieved excellent efficacy, accuracy, and safety, with a small benefit in eyes treated on the refractive astigmatism axis. However, in eyes where the axis discrepancy was between 21° and 45° (large angle group), the ACA axis treatment showed statistically significant inferior outcomes. Significantly fewer eyes achieved 20/20 UDVA and a defocus equivalent of 0.25, 0.50, and 0.75 D or less, and significantly more eyes had an angle of error above 15° and postoperative residual astigmatism of 0.75 D or greater. The overall rate of outliers for the ACA axis treated group was 8.1% compared to only 4.6% in the refractive astigmatism group. Eyes treated on the ACA axis also had a greater excimer laser re-treatment rate. To the best of our knowledge, only two previously published studies addressed the Contoura-measured ACA axis and magnitude: the Layer Yolked Reduction of Astigmatism (LYRA) protocol9 and the topography-modified refraction (TMR) protocol.10 The current study similarly investigated treating the ACA axis, but differed by treating the clinical manifest refractive astigmatism magnitude concurrently. 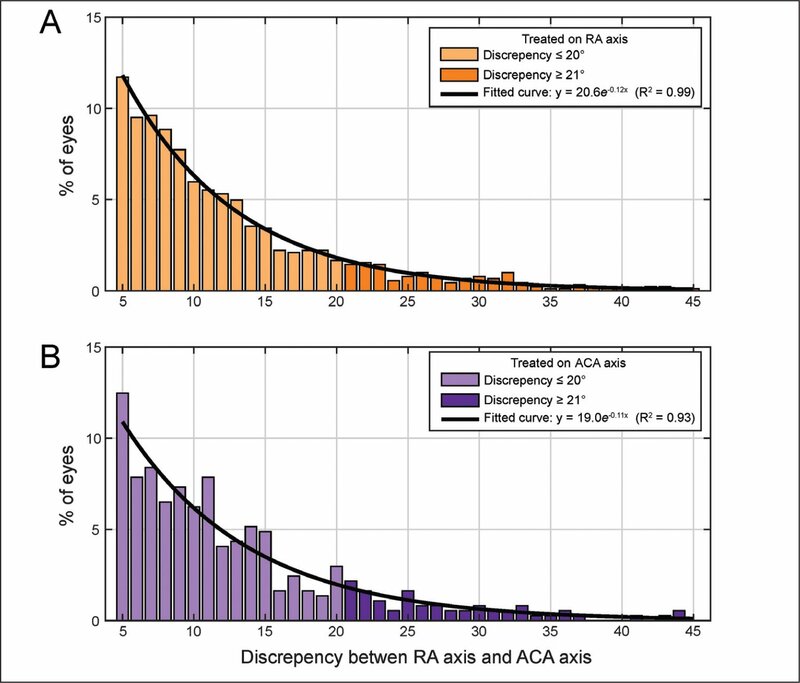 The TMR study claimed superior outcomes in eyes treated on the Contoura-measured ACA compared to traditional refractive astigmatism treatment.10 However, it did not look at the difference in refractive astigmatism and ACA magnitude and axis, and did not verify whether both treatment groups had the same amount of preoperative ORA, which might have invalidated comparisons. The TMR study also showed poor manifest refractive astigmatism treated outcomes, with only 61% of eyes achieving 20/20, and 28% of eyes with postoperative residual cylinder above 0.50 D.10 In contrast, the FDA study7,8 and the current study, which included corneas with naturally occurring irregular astigmatism, achieved excellent manifest refractive astigmatism treated outcomes, with nearly 90% of eyes achieving unilateral UDVA of 20/20 and less than 5% with residual cylinder above 0.50 D. The fact that the TMR study obtained poor outcomes in the manifest refractive astigmatism treated eyes partly explains why the ACA treated eyes appeared to do so well. Neither the LYRA study nor the TMR study reported standardized Alpins vector analysis as recommended.12 The LYRA study9 did not have comparative ACA to refractive astigmatism groups and did not report defocus equivalent. The latter would more adequately discern lesser outcomes. These two previous studies did not have an adequate sample size to conclude on ACA treated outcomes, with only 26 and 50 patients.9,10 Although ACA treated eyes did less well in this study, outlier eyes (refractive astigmatism of 0.75 D or greater postoperatively) overall were uncommon, even with ACA treatments. Only 8.1% of the total cohort of ACA treated eyes were found to be outliers, with one-third occurring in the LAD group. The two previous studies also included spherical and low astigmatism eyes, as well as eyes with little or no axis discrepancy, which would further reduce the chance of having outliers with clinically significant postoperative residual astigmatism. Although the current study focused on the effect of treating the astigmatism axis, the authors propose that treating on the Contoura-measured ACA axis and magnitude would also lead to worse outcomes, particularly in eyes with a larger discrepancy between the refractive astigmatism and ACA magnitude (eyes with higher ORA). A recent comparison of the manifest refractive astigmatism magnitude and ACA magnitude in more than 5,400 eyes suggests that posterior corneal astigmatism is additive or subtractive to ACA magnitude, and accordingly the net total corneal astigmatism influences the manifest refractive astigmatism magnitude.15 Therefore, similar to toric IOL surgery that ignores posterior corneal astigmatism,16 only treating the Contoura-measured ACA magnitude could lead to overcorrection or undercorrection of astigmatism, resulting in less predictability. Furthermore, postoperative vector analysis showed a magnitude of error that was the same and not elevated in the ACA axis and refractive astigmatism axis treated eyes, including the large angle group. The magnitude of error was within 0.50 D in at least 95% of eyes in all four subgroups. The manifest refractive astigmatism magnitude as the treatment input parameter led to an accurate correction of the astigmatism magnitude, validating the study design of keeping this variable constant. However, the angle of error was significantly elevated in the ACA axis treated group, showing less accuracy than treating on the manifest refractive astigmatism axis. In both refractive astigmatism axis and ACA axis treatment approaches, eyes in the large angle group had a lower TIA versus SIA predictability. Eyes in the large angle group also had an elevated mean ORA of greater than 1.00 D (Table 1). Previous non–topography-guided studies have shown that eyes with higher ORA had poorer predictability.17–21 The dilemma of treating on the manifest refractive astigmatism versus measured ACA axes in eyes with significant ORA was previously studied by Alpins and others to improve refractive outcomes, as early as 20 years ago.22 The vector planning method treats a 60/40 split between manifest refractive astigmatism and ACA. 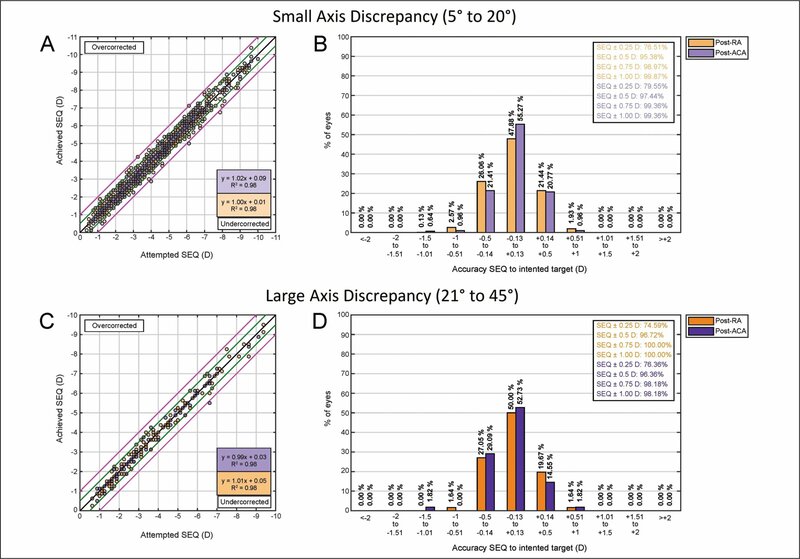 A recent study using this methodology suggested visual outcomes comparable to treating manifest refractive astigmatism, better SEQ accuracy, and less postoperative ACA, but with increased variability in the correction index (more undercorrected and overcorrected).23 More studies with a larger number of eyes are needed to determine the benefit and define clear guidelines. This large cohort study using the WaveLight EX500 excimer laser in combination with the WaveLight Contoura topography-guided software in eyes with preoperative refractive astigmatism of 0.75 D or greater shows excellent results. However, treating on the Contoura-measured ACA axis leads to inferior visual and refractive outcomes. The current study does not support the two previous studies that show a benefit for treating on the Contoura-measured ACA compared to treating on the clinically measured manifest refractive astigmatism. Lesser outcomes become significantly more evident in eyes treated on the ACA axis when the manifest refractive astigmatism to ACA axis discrepancy is greater than 20°. Adding CONTOURA Vision, Topography-Guided LASIK to the Refractive Armamentarium. In: Eyetube.net, Alcon, 2017. Kugler L, Crews J, Morgarn L. Ocular residual astigmatism. Cataract & Refractive Surgery Today. 2014:16–18. Alpins N. Ocular residual astigmatism: when zero is not the target. In: Alpins N. Practical Astigmatism Planning and Analysis. Thorofare, NJ: SLACK Incorporated; 2018:65–76. From the Department of Ophthalmology, McGill University, Montreal, Quebec, Canada (AW); LASIK MD, Montreal, Quebec, Canada (AW, MG, SRQ, MB, MC); the Department of Ophthalmology, Laval University, Quebec, Quebec, Canada (SRQ); and the Department of Ophthalmology, University of Sherbrooke, Sherbrooke, Quebec, Canada (MC). © 2019 Wallerstein, Gauvin, Qi, et al.